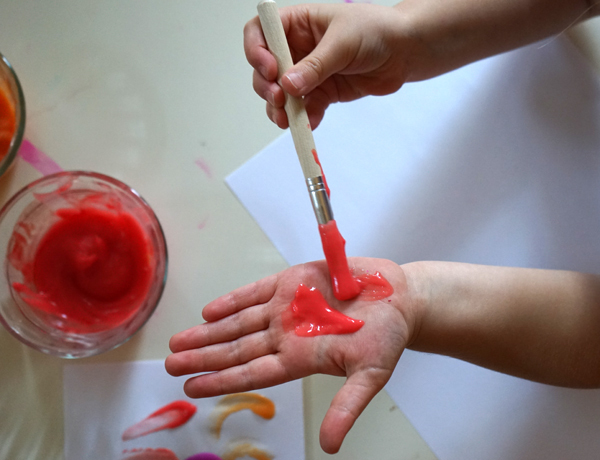 Today I’ll share how to make the easiest homemade finger paint from basic, edible ingredients: flour, water, and food coloring. 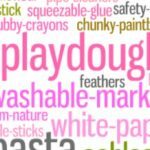 Do you ever worry about the ingredients that come in store-bought paint? This is less of a concern now that my children no longer put everything they find in their mouths, but I thought about things like this when my kids were toddlers. Seeing the “non-toxic” label certainly helped, but it’s another thing to know that the ingredients in my art supplies are entirely edible. The basic ratio is 1 flour: 2 water, so scale up or down according to how much paint you’d like to make. 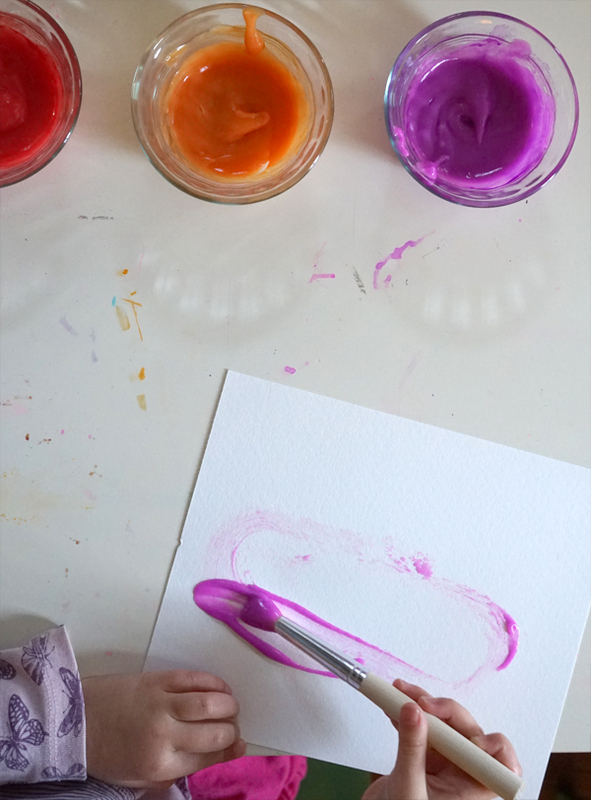 We used washable, non-toxic liquid watercolors to add color to the paint, but you could also use food coloring for a similar effect. 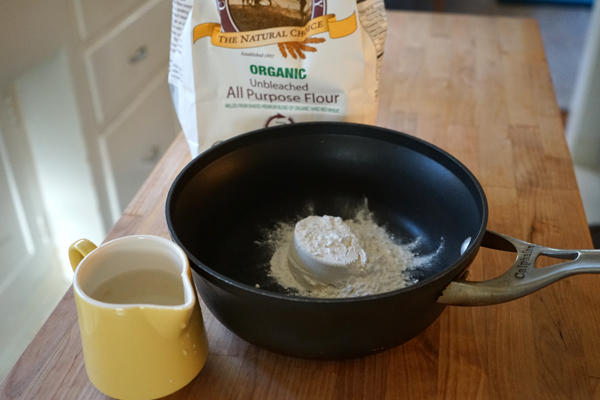 Pour flour and water into a pot. 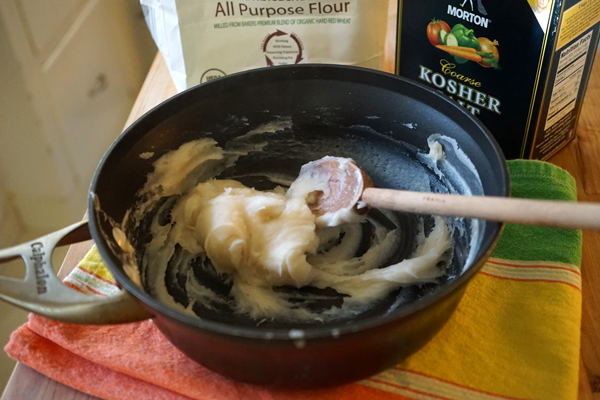 Stir the ingredients over medium heat until it comes together like smooth, thick paste. 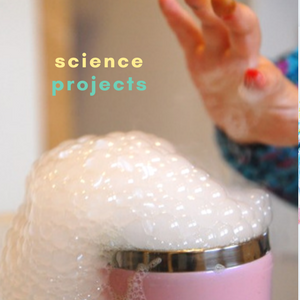 The mixture will be lumpy along the way, but it all comes together. When it starts to pull away from the pot, remove from the heat. Add a pinch of salt. 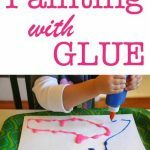 This helps keep the paint from spoiling if you don’t use it right away. 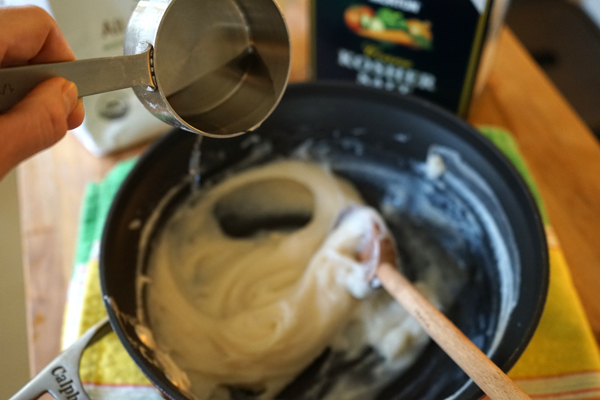 To reach the desired consistency, slowly add cold water to the mixture. I added about 1/4 cup water to our paint. Divide the paint into bowls. 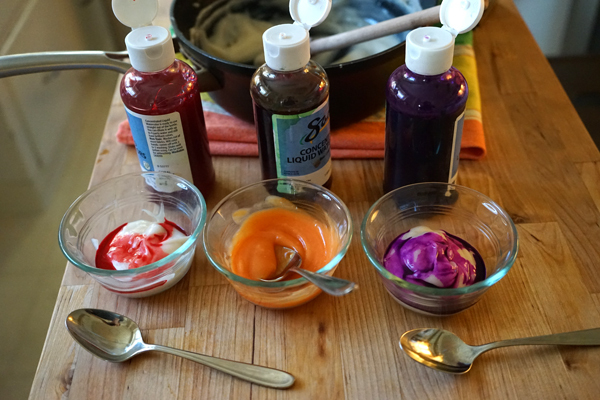 Squeeze food coloring or liquid watercolors into the flour mixture until you reach the desired color. Store in a covered container in the fridge if you’re not planning to use this right away. It will keep indefinitely. 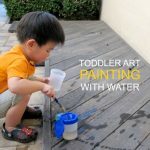 These liquid watercolor paints are washable and non-toxic, and my absolute favorite. The pack of eight colors (8 oz. each) is about $30, which makes each bottle just under $4. 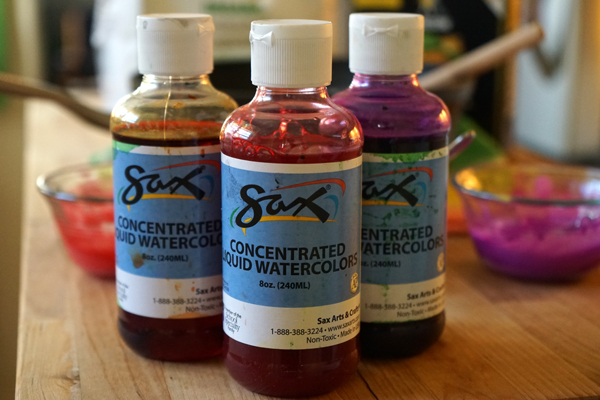 When you consider how much food coloring you get in a tiny bottle, these liquid watercolors are totally worth it, in my opinion. If the value-pack is out of stock or you’re not interested in committing to eight colors, you could also order these paint bottles individually. Now the paint is ready to experiment with. The texture is like pudding and feels nice on the hands. 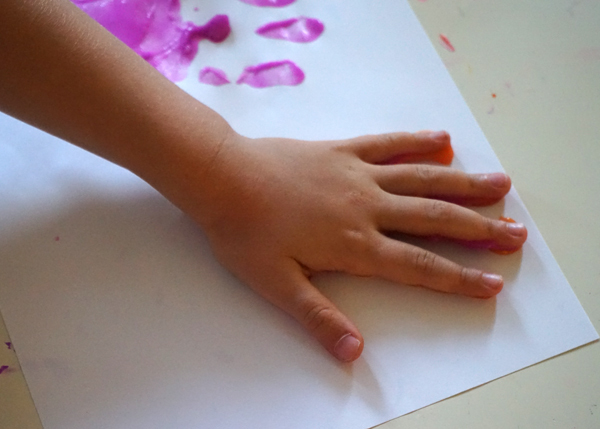 My kids enjoyed painting it on their hands to make hand prints, and they also used brushes to paint in a more traditional way. 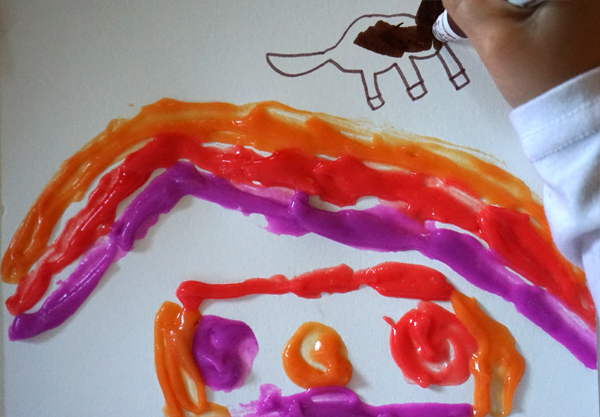 My 5-year old made this painting, and the thickness of the paint meant that it took a solid 24-hours to dry. The thinner the paint is applied, the quicker it will dry. 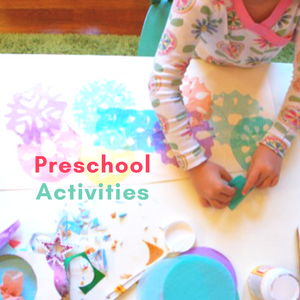 The paint is perfect for finger painting, but less than ideal for using a paintbrush. 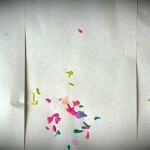 My kids didn’t seem to mind, but it’s something to consider if you’re looking for a traditional paint recipe. 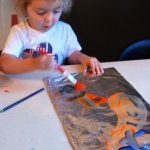 The texture and quality of the paint make it ideal for finger painting, but my kids still loved it. 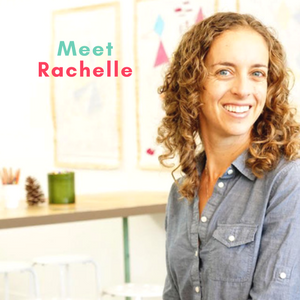 Keep in mind that generally speaking, children are more interested in the process of making something than in the final outcome. 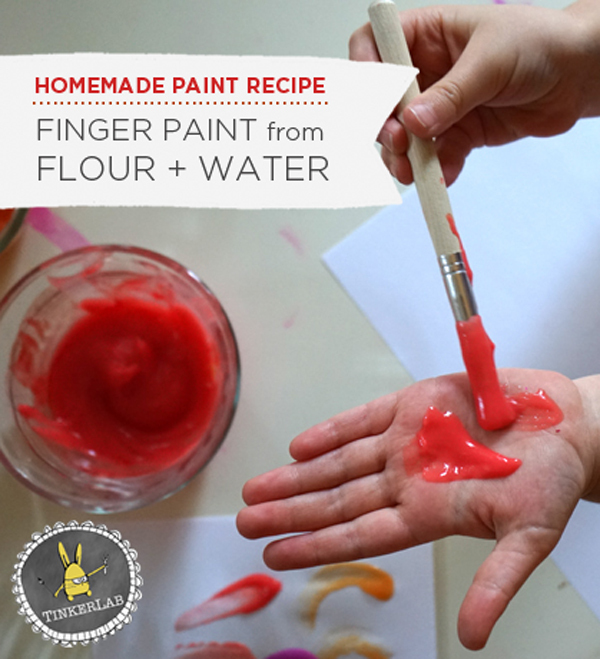 I asked my children (ages 3 and 5) numerous times about the paint, and they agreed that this recipe is a keeper. 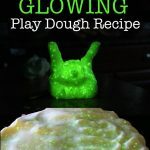 The BEST play dough recipe, seriously. It’s an amazing recipe that will keep for ages. Marbleized Paper, this stuff is GORGEOUS! 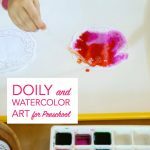 Watercolor Painting — make these adorable watercolor bunnies. 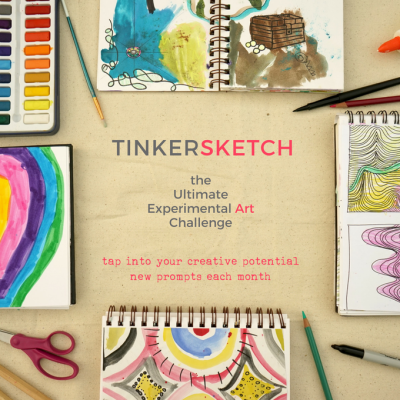 Straw-blown watercolor painting — this is such a fun, all-in activity. W giggle every time we do it. Thanks so much! My 9 month old loved this! I covered her in aquaphor to avoid stains on her skin, which worked perfect. 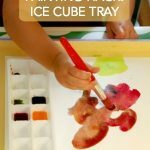 If you use a lot of food coloring you can achieve vibrant colors.